Beck served as the design architect and construction manager, delivering this project using a unified design-build method. The owner recognized design-build was the best delivery method to complete the project in the time frame given. Within Beck’s integrated organizational structure, the architects and contractors worked side-by-side to deliver both world-class design and building expertise. 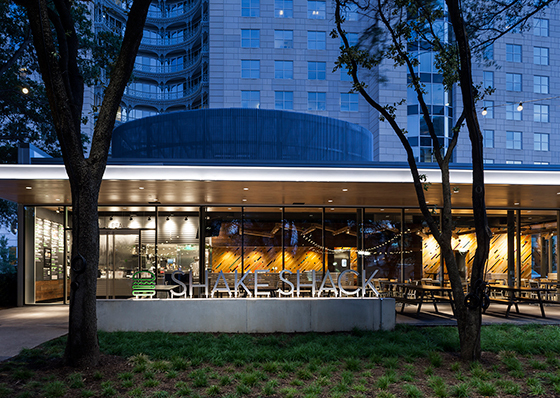 Built on a leftover corner of the Crescent Development in Dallas, Shake Shack was designed to activate the space creating a public space that serves as a mini park. Under the trees a floating canopy adds shade by day and illumination at night draws the eye in. Designed to reflect the values of Shake Shack, the materials and detailing attempt to blur the line between the park and dining room, bringing the outside in.